Stop in to see our large selection of quality wines at affordable prices. Our focus is on excellent value and personalized customer service. It is our pleasure to match wines that fit your palate and budget. Our friendly staff is always happy to assist you. 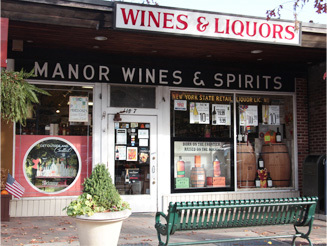 Manor Wines & Spirits carries a wide selection of spirits from all over the world. We have a large selection of single malt scotches, ryes, bourbons (including many small batch selections), gins, vodkas, rums and liqueurs. Our Champagne and sparkling wine wall is filled with many exceptional values. We take pride in our selection. If you can’t find what you’re looking for, simply let us know and we will special order it for you. We also offer gift baskets and free, local delivery.